Baskets are a great way to store things in any room. I have baskets in every room in my apartment. 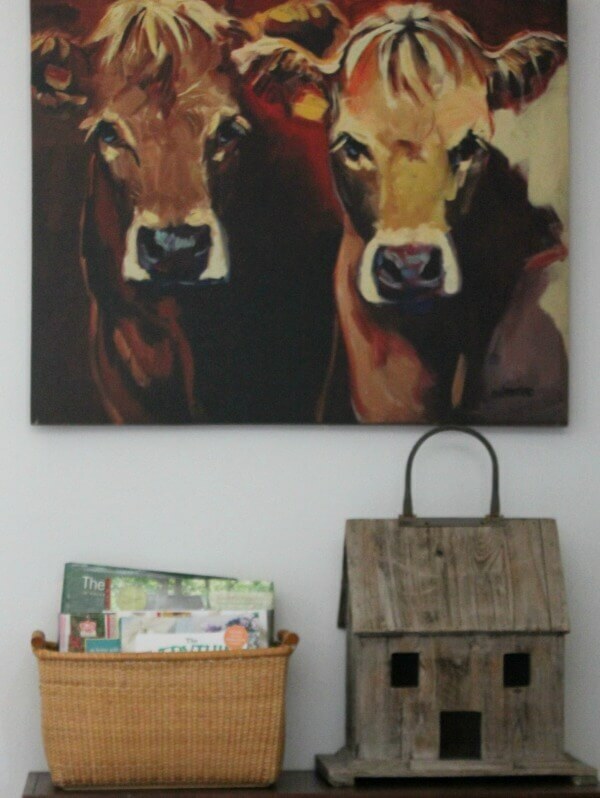 In this post I’ll show you a few ways I use baskets in my home for storage. I’ve been decorating with baskets and using them for storage for many years. Back in the seventies we used flat baskets to decorate our walls. Now I’m seeing that again in boho style decor. I store my cutting boards in this huge basket I found in Jenks. It’s a $10 basket that looks vintage. I could not pass it up. This basket is almost 2 feet long! So there are endless possibilities for storage with his basket. 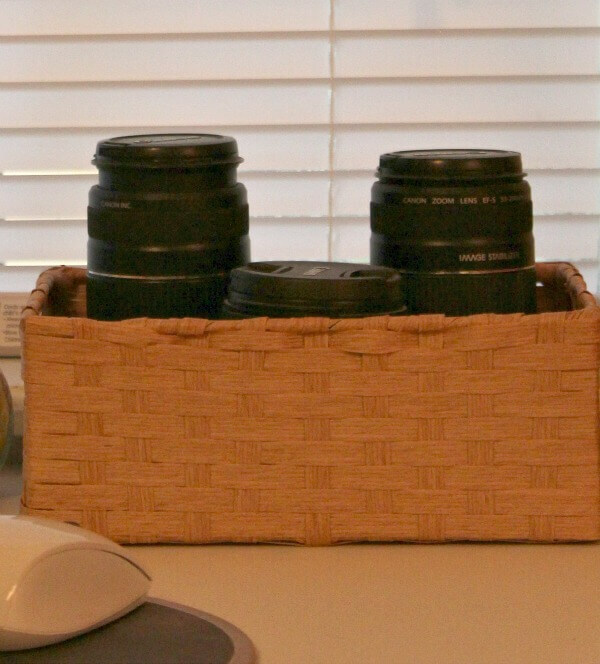 I corral my various camera lenses in a basket on my desk. There’s always one lens on the camera so I can take a quick pic, and it’s generally the zoom lens. I find that storing my lenses in this little basket keeps them safer. I don’t have to worry about them falling over and rolling off my desk. Camera photo lenses aren’t cheap! I store decorating and gardening books in a basket on a shelf in the living room. The ones I thumb through the most are right at hand to browse through whenever I’m mulling redecorating or starting a new project. 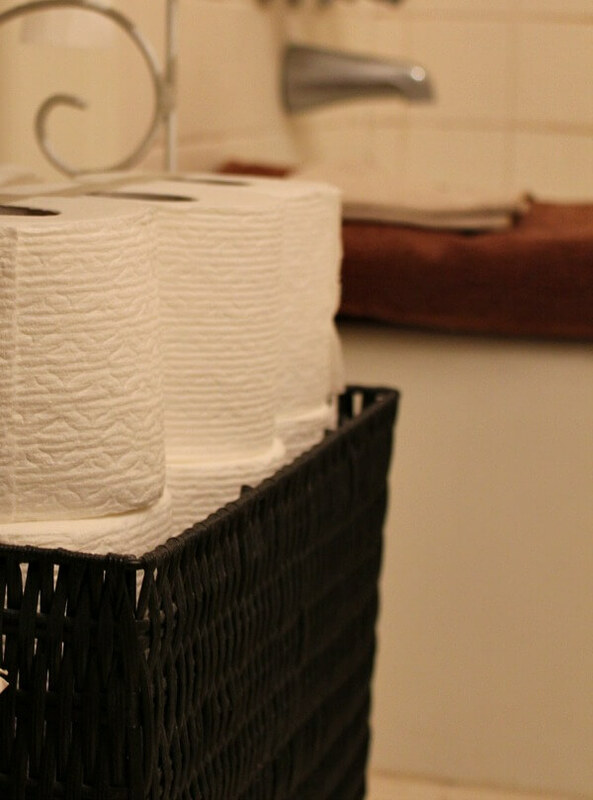 I keep toilet paper in a big rectangular basket on a bathroom shelf where it’s handy. I also have paper towels in a similar basket on the bottom shelf of the kitchen cart. I prefer to store them in baskets so they look a bit decorative. It’s always better to make containers look decorative so they blend right into your decor. A basket is also a good place to store vintage canning jars. 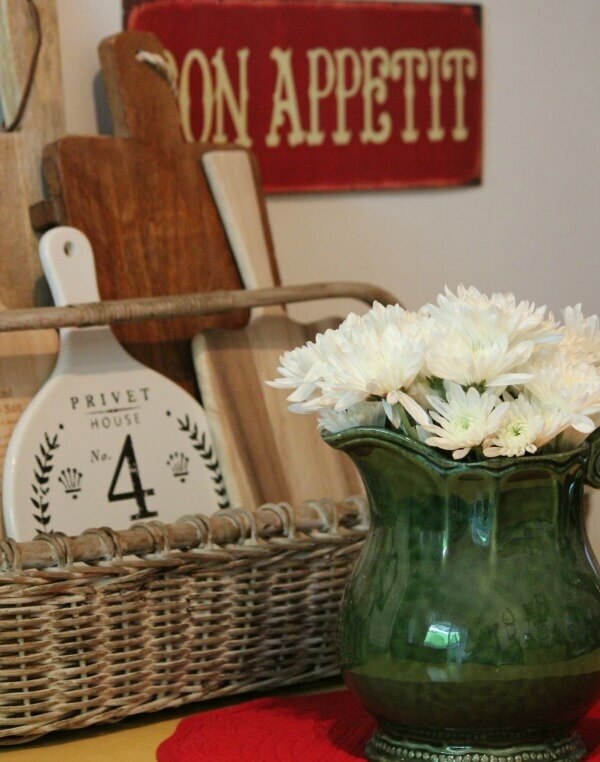 Not only are baskets handy for storage, but they provide wonderful texture to your decorating. Do you use a lot of baskets? Where are you favorite places to use baskets? Thanks for bringing up this subject. I can see from your ideas that I might need more baskets for the kitchen counters. I like to use baskets on bookshelves to store books to make the bookshelves more tidy. That's my favorite look. And the big baskets from Target come in handy to store holiday decorations up and out of the way on top of my kitchen cabinets. I love this post on baskets. My favorite baskets are rustic ones out of twigs or vines. I recently was working on a little sewing project and I threw some fabric scraps of different colors and patterns into a small twig basket just to tidy up the area as I was working. I was surprised to see how pretty the scraps looked in the basket, so I sat it on a table in the living room to admire for awhile. My husband usually doesn't notice any change in décor for months, but he spotted the basket of fabric right away and said it looked nice. That is what you might call serendipity decorating. Love your baskets and how you have used them through out your home. I love to use baskets too through out my house. Love the texture they give to the vignettes. Awesome to have pretty and storage with baskets. Happy Friday. I use a lot of baskets. I have one with tp in it for sure. I use them to corral pens, paper and bills. Lots of them in my spare room for storage. Baskets are great!!! 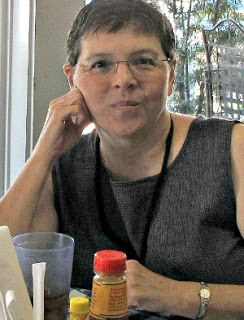 Beautiful Brenda! I also love baskets and keep everything in either a basket or a wooden crate. Have a beautiful day! I think I use trays like you use baskets. I have them everywhere and they corral tons of things. Lots of lovely and useful baskets here Brenda! I use them a lot too, for yarn, sewing things, tubes of paint, and children's colouring books, crayons and felt pens to name but a few! 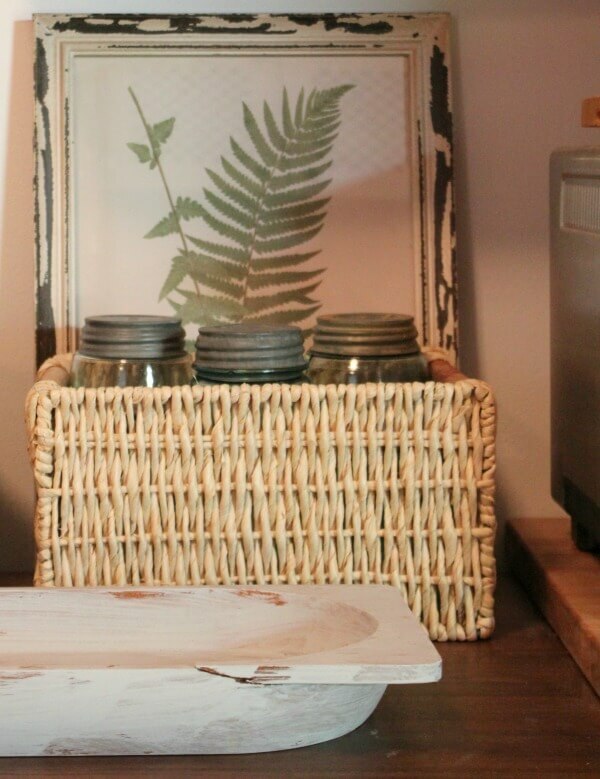 I love baskets in every room of the house…so useful and they add beautiful texture to decor! I love baskets. I love the texture of them. I also use several around the house, for toilet paper, magazines, paper napkins, and large ones to keep my throws in. I feel so stupid! I have several old white oak baskets (handmade) on the very top of my kitchen cabinets just for decoration. Why have I never considered storing things in them? Thanks Brenda! I used to have a ton of baskets above the cabinets in my kitchen. During my simplifying stage, I donated most of them, but lately, I have been picking a few up. They are sweet accents, aren't they? I love your ideas Brenda! Baskets are not just useful but add to your décor beautifully. I don't have that many wicker baskets, but I do have a lot of metal baskets and trays that I use to corral everything. I also use old mason jars to hold pens, hair bands, etc. I love using baskets in my little house. They have great visual appeal and I use them in every room. I store things in them and they help me keep things organized. I don't have an inch to spare and must have a place for everything. Baskets are great for corralling what could become cluttered looking in my small home. Enjoyed your photos, Brenda! That big basket is a beauty!!! Good for you! My best idea is one of those baskets designed to hold silverware and napkins for picnics. I keep it beside my comfy chair and it is stocked with reading glasses, nail stuff, paper, pens, eye drops, hand cream and much to her disgust….a skinny can with pennies in it to shake at the princess cat when she is up to no good!!! Baskets are the BEST! I use them on my bathroom vanity to hold hair brush, comb, hairdryer, etc., I use them in my kitchen for fruit and in my bathroom for tp and toiletries. Love your ideas! Love baskets! Yours are wonderful . I have large ones and a teeny tiny one that holds 2 bottles of my eyedrops. So handy and pretty to look at. I love baskets, too! I have some low-sided ones in the kitchen that are used as drawers in my small pantry closet so I can easily get to the things at the back of the shelf without knocking everything else over in the process. Love your ideas! I use them in my office to corral scrapbooking supplies and in the bathrooms to hold extra TP. I use all of my baskets one way or another because I sell Longaberger baskets. Great decor, organizing, serving food, etc.